Continuing further with the series of blog posts I have started putting together a couple of weeks back on video clips and pictures I have been taking here in Gran Canaria, here I am again at it, this time around sharing a couple of short video clips I took with my Nokia N95, once again, from one of those places that, if anything, is just breathtaking. And I am probably too short with that description. 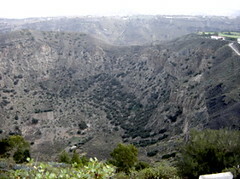 Yes, I am talking about La Caldera de Bandama, up in the north of the island. 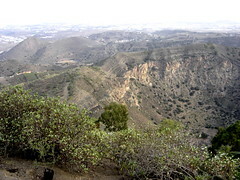 "[…] a volcanic crater – 1000 m (3300 ft) in diameter and 200 m (660 ft) deep – with a 569 m (1,867 ft) high peak, the Pico de Bandama, to which you can drive up. This peak has an observation platform, from where – despite its relatively low height – you can enjoy breathtaking views of the entire north and east coast and towards the mountainous centre in the west. With a clear sky you might even get to see the neighbouring island Fuerteventura in the northeast." If you would want to read some more about it, you can certainly go ahead and check out Centre Tour – Caldera de Bandama, which provides a quick, short description of what makes that place special. And once you are done with it, here are the couple of videos I have shared earlier on today where you can see how every now and then I get to go there, just to chill out and admire the work of nature. Like I said, stunning! !